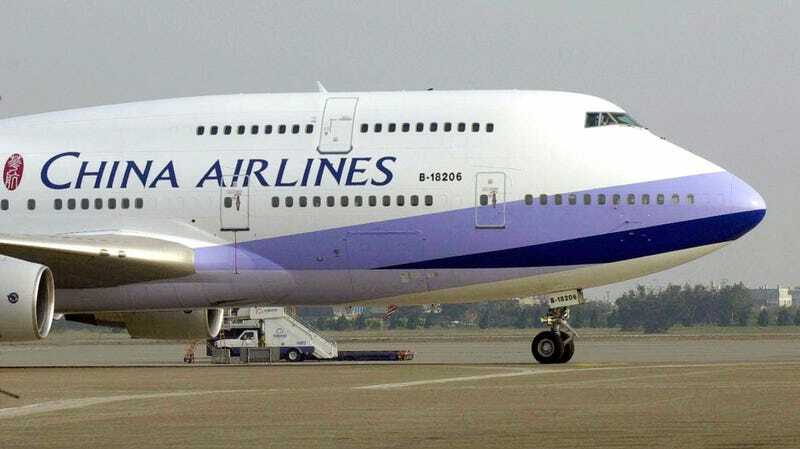 A China Airlines Beijing Boeing 747-400 at Chiang Kai-shek International airport in Taoyuan, Taiwan. The mainland Chinese government has demanded U.S. airlines change their websites “to reflect China’s claim on the island territory” of Taiwan, Bloomberg reported on Tuesday, and they pretty much plan on doing that rather than risk any kind of retaliation. The U.S. carriers affected by the mandate — American Airlines Group Inc., Delta Air Lines Inc., United Continental Holdings Inc., and Hawaiian Holdings Inc. — will begin to change the Taiwan references over the next day or two, said the person, who asked not to be named because discussions among the carriers were private. The four airlines had been hoping for a negotiated resolution between the U.S. and Chinese governments ahead of China’s July 25 deadline. Other airlines, including Qantas Airways Ltd., Air France-KLM and Deutsche Lufthansa AG, have already cooperated with China’s wishes. Civil Aviation Administration of China spokesman Geng Shuang told reporters, “Let’s wait and see” if the airlines comply. Bloomberg added that Air India Ltd. has also already switched their flights to read “Chinese Taipei” after receiving threats of penalties. Democratic Taiwan has been ruled separately from mainland China under the name Republic of China since the end of the Chinese Civil War in 1949 (both governments could be delicately described as not fond of this outcome). However, under the One China policy, the US has long acknowledged that the mainland People’s Republic of China is the sole legitimate government of Taiwan, and generally maintains only unofficial diplomacy with the latter even while selling it advanced weaponry. Both the PRC in Beijing and the Taiwanese government in Taipai essentially signed off on a policy in 1992 in which both sides agreed there is only “One China,” but agree to disagree on how that is defined. Again, everyone involved tends to be pretty sensitive about this, because the alternative could be a devastating war potentially capable of dragging in the Taiwanese government’s Western allies like the U.S.
United, Air China and China Eastern together account for more than 50 percent of the market share, followed by China Southern. Hainan Air replaced Delta as the fifth-largest carrier on this route amid its aggressive launch of direct flights from second-tier Chinese cities to the U.S. Both the U.S. and the PRC remain embroiled in a trade war that could impact everything from soybean farmers to 5G technology. Trump has struck closer ties to Taiwan’s pro-independence President Tsai Ing-Wen, including ignorantly accepting a post-election phone call from the latter leader and encouraging greater diplomatic ties, worsening relations with the PRC in the process.